Construction of the garage is a responsible business. It is very important that as a result it becomes a reliable protection for your car. You can use different materials for such works, for example, brick, wood, aerated concrete and foam concrete. Next will be considered the construction technology of the garage of foam blocks. You will learn about the distinctive features of this material from this article. First of all, you need to pick up a piece of paper and a pencil in order to plan the future construction. The presence of the project will allow you to make a rough analysis of the consumption of building material and, accordingly, financial resources. 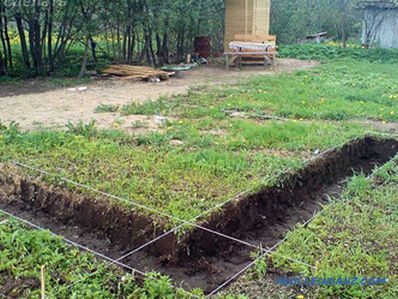 Moreover, it is necessary to analyze the soil, namely at what depth are the groundwater. Also determine the feature of the soil structure. 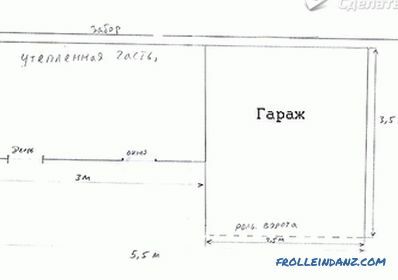 Already building on the information received, it will be possible to decide what type of foundation to be erected. 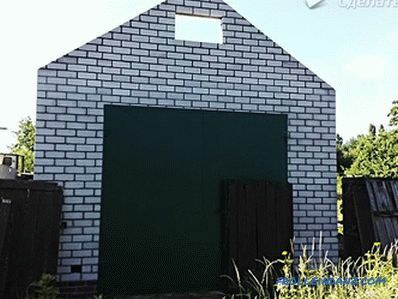 The project of the garage from foam blocks can be performed using special computer programs. However, you can make it yourself. 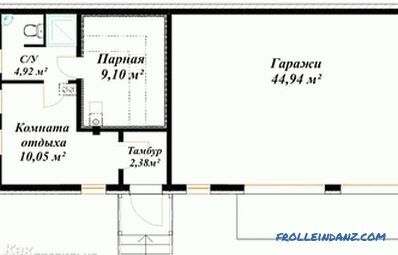 So, you can take into account the peculiarities of your area in the project and make the planning at your discretion. do you need an additional working area, for example, a table, workbench, etc. 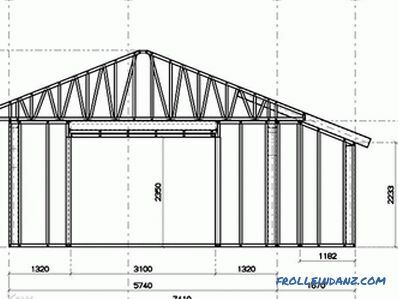 At the end of this article, a number of projects and drawings for building a garage are provided. If you are satisfied with this or that project, you can use it. But at the same time be sure to consider the features of your area: the level of groundwater and the structure of the soil. 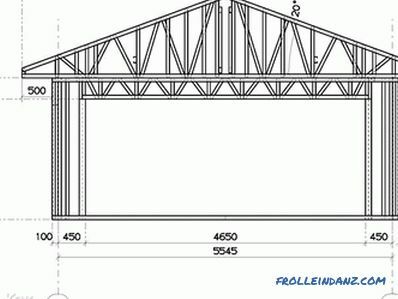 For example, take the dimensions of the garage 5 * 6 * 3 m. Now we calculate the length of the perimeter of the walls and, accordingly, the number of blocks in one row: (5 + 6) * 2 and divide block length 0.6 m. As a result, we get the following action: (5 + 6) * 2 ÷ 0.6 = 36.6 (37 pieces). Next, determine the number of rows. 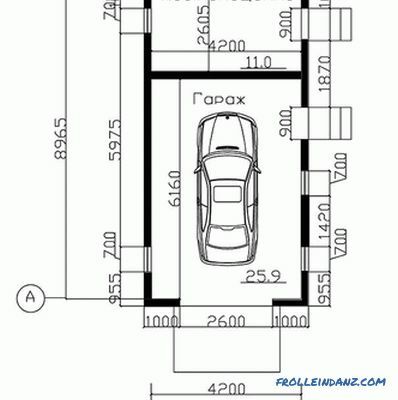 In our case, the height of the garage will have 3 m. So it should be divided by the height of the block 0.3 m. It turns out like this: 3 ÷ 0.3 = 10 rows. 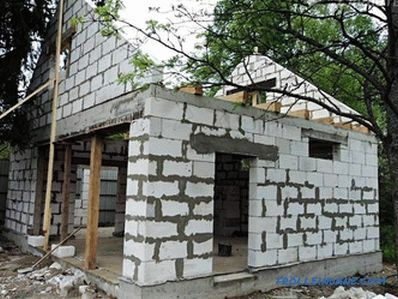 Based on this, you can easily determine how many blocks are required for the entire construction: 37 pcs. * 10 row. = 370 pcs. But it is also important to take into account the size of the gates, doors and windows, if any. If the laying of walls is performed with a thickness of 200 mm, then an average of 1 m 2 gates and windows includes 6 foam blocks. Based on the size of your gates and windows, you determine the total area of ​​the openings and multiply the resulting amount by 6. With standard sizes, on average, you get 40 to 50 blocks. In the end, you need to buy 300 - 320 foam blocks. According to this scheme, it is possible to calculate the number of blocks for a garage of any size. Be sure to consider the following nuances: during transportation there may be damage to the material, and in such calculations we did not take into account the thickness of the seam. For this reason, add 5% to the amount obtained. Otherwise, you may not have enough a few blocks to complete the laying of walls. After the preparatory work is completed, as well as after purchasing all the necessary material, you can proceed to marking the garage. In the corners of the future structure, hammer in the pegs. Along the entire perimeter between them, stretch the string. Be sure to check the angle between the threads. It should be equal to 90 °. Or you can draw axial markings - it's much easier and more accurate. If the length of the thread is the same, it will definitely be 90º. 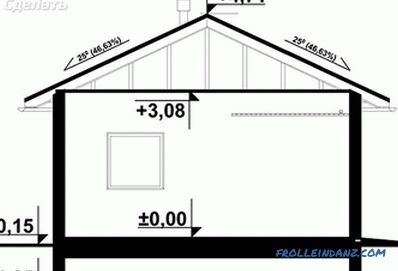 When marking, keep to the dimensions specified in the project. When the marking is done, stand near the future garage door and make sure that nothing will stop them from opening. It can be a tree, a building, a fence or something else.If there is no serious interference, you can begin to manufacture the foundation. 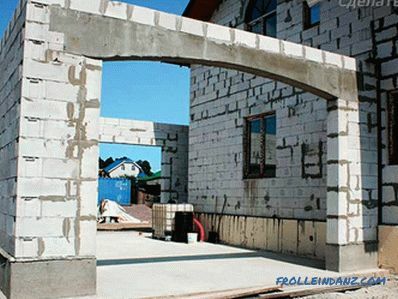 The foam block is a relatively light material, therefore the need for the construction of a recessed and heavy foundation disappears. But not only the weight of the material affects the choice of one or another type of foundation. A more important criterion is the type and properties of the soil at the construction site. 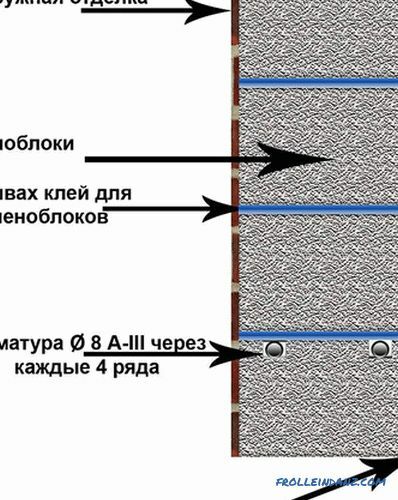 For example, if the level of groundwater in your area is below the 2-2.5 m mark, and the soil is not uniform and dense, then you can build a light strip foundation with a depth of up to 0.5 m. Quite a different situation occurs with heaving soil. , because you have to build a monolithic foundation. This is due to the peculiarity of blocks that do not tolerate bending stress. As a result, the foam block bursts, and the building itself collapses. 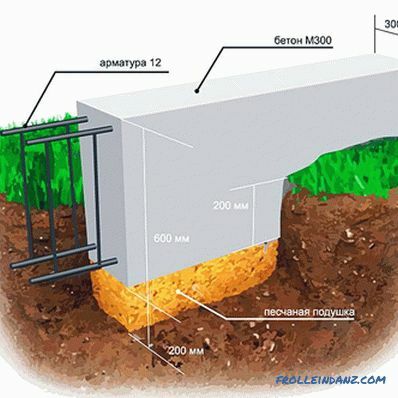 To avoid this, the walls are laid out on a monolithic slab that “floats” in the ground along with the entire structure. If the project provides for the construction of a viewing pit, then the variant of the foundation with a monolithic slab disappears. In this case, you will need to build a submerged belt or a combined tape-pile foundation. A trench 0.8 m deep is dug. 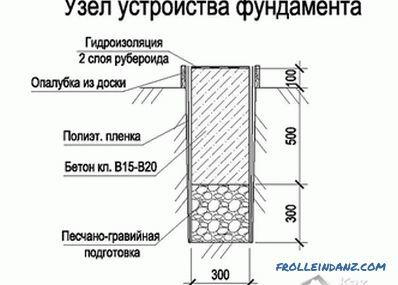 Width equal to foam block (200 mm) and add 150 mm, in the end the thickness of the foundation is 350 mm. The bottom of the trench should be carefully rammed. After that, a sand cushion consisting of 100-150 mm of sand and 70-100 mm of rubble is filled up. Each layer is also rammed. 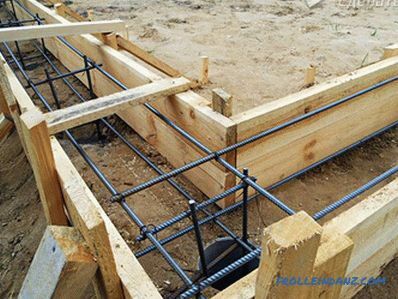 It is necessary to place in the trench a welded or bonded skeleton of reinforcement. As a result, you will make a frame for strip foundations. Next, you need to fill the foundation with concrete, vibrating at once and thoroughly. 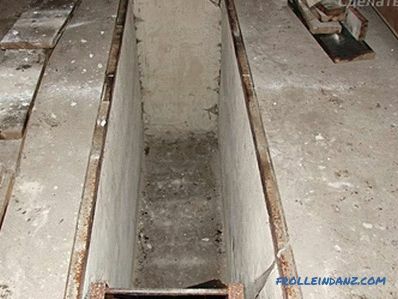 While the concrete is drying, you can proceed to the production of the inspection pit, if provided for by the project. Recall that in the construction of the inspection pit it is necessary to take into account the depth of the groundwater. If the depth is more than 2.5 m, then drainage is not necessary. If less, then drainage, respectively, is necessary. We invite you to familiarize yourself with the manufacturing process of the inspection pit, in which it is necessary to make a drainage. You should also make calculations for its size. The length is chosen taking into account the size of the car, usually 2 m is enough. As for the depth, it should be such that it is comfortable to move around. So, you take into account the growth of the car owner, adding to it 30 cm and the clearance of the car, which is equal to from 120 to 175 mm. As a result, the approximate depth will reach up to 1800 mm. (30 cm is a lot - you will not get to the car. The clearance of the cars is different and this should be taken into account in advance, taking into account the performance of the existing car. At first, earthwork is carried out, taking into account the thickness of the floor screed, cushion, waterproofing layer and drainage. Trenches are dug around the perimeter of the excavation for organizing drainage, up to 500 mm deep. but the trench is covered with geotextile. It is necessary to wrap 80 cm on the trench wall. Next, a 50 mm layer of gravel is filled up and a drainage pipe is mounted on top. Perforated plastic, asbestos cement or ceramic pipes can be used. a small slope for their functionality. 1 cm of slope will suffice for 1 m.
After that, fill the pipe with a layer of gravel at 20 cm and wrap the geotextile. So, the drainage is ready. The future floor of the pit is filled with a small layer of clay that needs to be tamped down. The next layer spreads roll waterproofing, for example, roofing material or polyethylene film. After the floor formwork is made, the reinforcement frame is laid out of reinforcement and poured with concrete. It is recommended to add "Dehydrol" or "Concrete Mixer" for the manufacture of waterproof concrete in the concrete mix. When the floor screed is dry, re-waterproofing is carried out. If the groundwater is high to the ground level, then the walls of the observation pit are also plastered / tamped with clay. 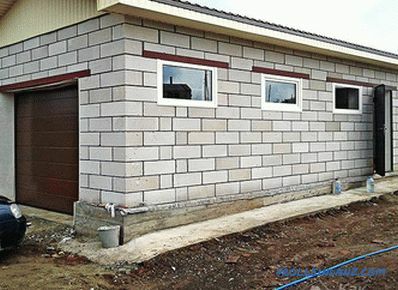 For the construction of walls, you can use a brick or make monolithic concrete, having previously made a waterproofing and built a formwork with reinforcement. The last option is most relevant for high groundwater levels. 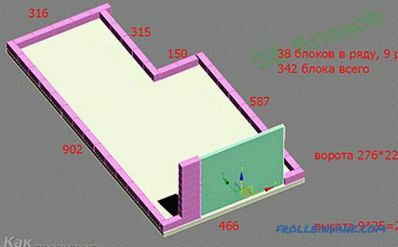 A waterproofing layer is laid on the walls, which is connected to the waterproofing of the floor. All joints, slots and edges carefully handle. After that, pouring concrete. When the walls are dry, you can finish the walls and floor of the viewing pit. Walls can be plastered and lined with tiles or fiberglass plates. A rail must be installed at the top of the pit. 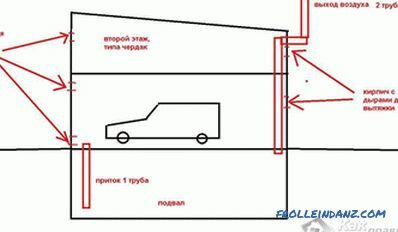 It is needed with the intention that the car accidentally fell into a hole. For its manufacture uses a metal corner of 60 mm. The size of the pit is welded frame. Laying on the pit, the frame is concreted. Upon completion of construction, it will be possible to lay boards on the corner (40 mm thickness is enough) to close the pit. 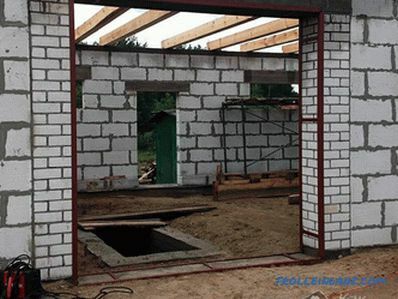 This stage of work can be performed either immediately after the foundation has been cast for the walls of the garage or after their construction. Before the construction of the walls, it is important to install the gate. They will be partially embedded in the wall. Before installing them on the foundation it is necessary to lay a waterproofing layer of roofing material in 2-3 layers. Weld pieces of reinforcement 40 cm Ø12 mm to the framework of the gate. On each side must be welded to 4 pieces. 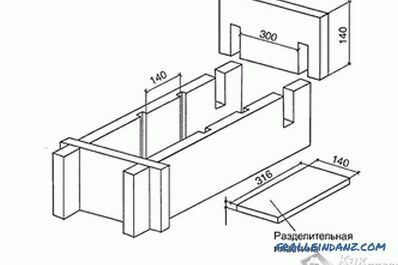 The location of the bars must be made so that they fall on the seam of foam blocks. And before you install the frame gates, they should be painted with a preliminary primer. 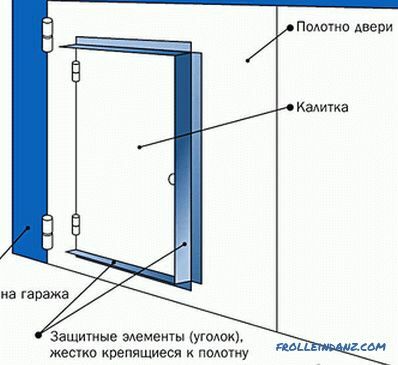 The installation of the gate should be strictly according to the level. Therefore, in this process, you must use the level and plumb. It is possible to fix the gate with the help of wooden bars, setting them diagonally. To have a reliable gate the basis, the beam is made above them. To do this, you can make a metal frame and pour it with concrete. But remember, the length of the beam must be greater than the length of the opening at least 0.2 m on each side. As an option, you can install the finished beam by the form of an I-beam. In this case, from a metal corner of 50 * 50 mm weld the frame to the size of the gate. Install it should be so that from the inside of the garage it was right next to the wall. The corner is fixed with cement. Next, from above, install the I-beam on the frame and the gate. 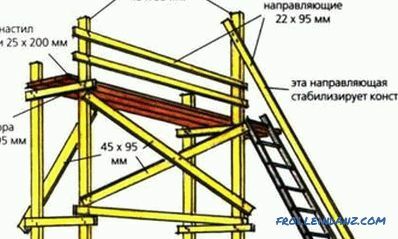 If it is planned to build a second floor, then an armor belt is being built around the perimeter to hold the floor slab. 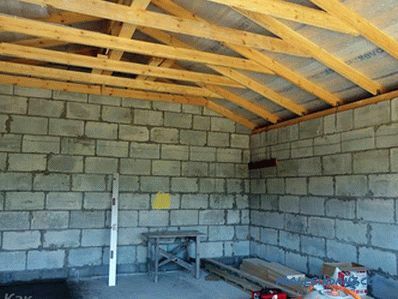 For a foam block garage, it is necessary, as it will hold the entire structure together and will be a reliable support for the roof. It is better to start building walls from a corner. Installation of blocks is carried out by the long side along the wall. 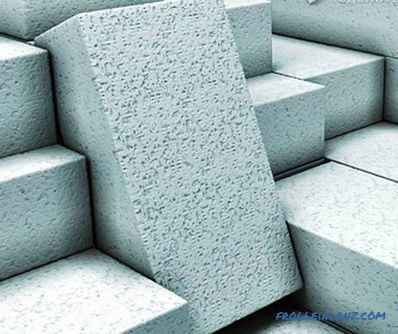 Foam blocks are stacked on a special glue or cement-sand mortar. If we talk about glue, it provides better thermal insulation. Therefore, its use is more efficient. Moreover, the glue consumption is relatively small. So, putting angles, stretch the rope between them. On it will be masonry walls. Every two rows of laying should be reinforced. For this purpose, a special mesh or masonry reinforcement is laid in the seam. The bars that you previously welded to the gate are embedded in the masonry between the blocks. 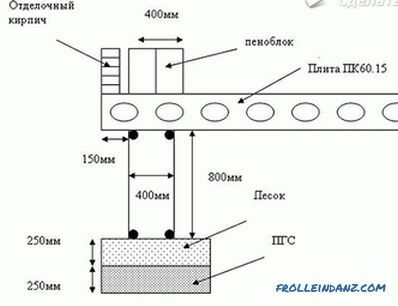 When you have reached the ceiling beam, you are laying without displacement of the block. If necessary, trim the block so as not to break the bundle of stitches. 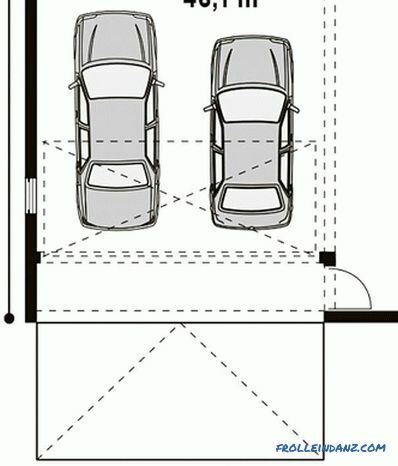 If the project has a single-pitch roof, the walls will be laid immediately performed at an angle to the rear wall of the garage. At 1 m linear enough 5 cm slope. To manufacture a slope, foam blocks are simply trimmed with a special hacksaw. Quite another thing is if the roof is gable. Then it is important to consider how the gables of the roof will close. As an option, you can continue laying out or use other lightweight material, such as clapboard. You construct a formwork around the perimeter of the walls 0.3 m high. In it the reinforcing metal framework from fittings keeps within. All this is concreted. 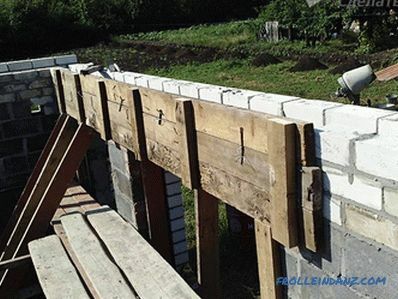 If a beam overlap is used to overlap the roof, then the need for building such a powerful armor belt disappears and, as a result, formwork is also not needed. It will be enough to lay out a layer of thick cement on the wall above the rebar and then re-layer the cement. 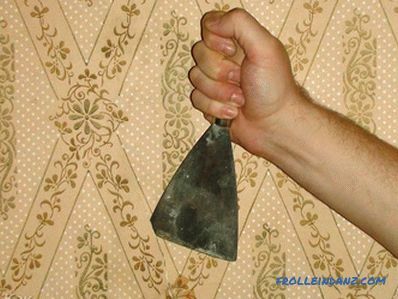 If necessary, remove the remaining solution with a trowel. It is important to control the thickness of the solution. It should not be in such a condition that it would run down the walls or it should not be too thick, which will crumble in an instant. 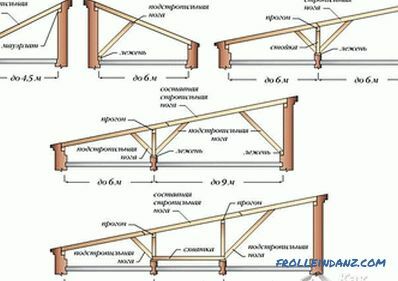 Cross the roof in 800 mm increments, install the beams.The length of the beam must be 200–250 mm greater than the wall, that is, it will be so much from two sides that the roof will hang down. This will protect the structure from precipitation. The beams are embedded in the wall. On the lower shelf, fold the boards 40 mm as tight as possible. Spread ruberoid on top of them. At the edges, the roofing material is folded by 10 cm. After that, you fall asleep over the roofing material with slag, expanded clay or other loose dry heat-insulating material. From the top of the insulation you make a thin cement-sand screed up to 3 cm. When the screed has dried, treat it with liquid bitumen mastic, for example, Primer. After this, by fusing, spread the roofing felt across the garage in the direction from the bottom of the roof upwards. Each canvas stacked overlap, which will provide a stack of rainwater and melt water without trickling it into the roofing “pie”. In conclusion, it remains to make a visor above the gate. 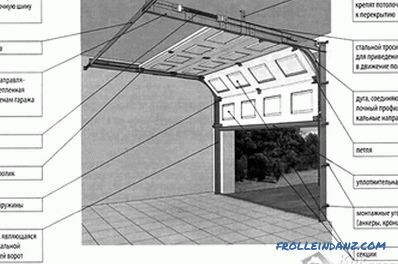 It can be made independently, having welded from a corner and fastening it with polycarbonate or other roofing material or to get ready. When the walls have already been erected, the roof is installed and the inspection pit is made, you can start building the garage floor. There should be a solid floor, as the car will have a large load on the screed. Therefore, the ideal solution would be to manufacture a concrete base. Wooden flooring can be performed directly in the pedestrian zone, especially if the working area and the installation of tables are planned. 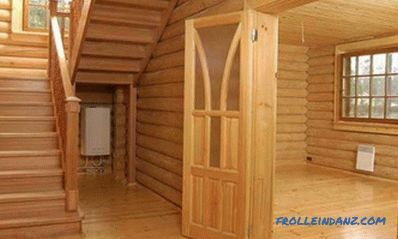 It will be more comfortable to be on a wooden floor than on a concrete one. At the end, the concrete screed is poured at least 200 mm thick. 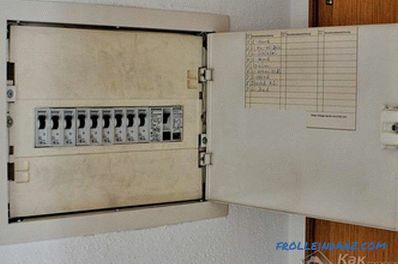 After that, you will need to finish the walls, carry out the necessary communications and start your car in its new, reliable and dry "house". It is worth noting that the purchase of foam blocks from the total cost of the entire project is about 30%. Most of the money goes to the arrangement of the base and roof. However, despite this, a foam block garage is considered one of the cheapest. 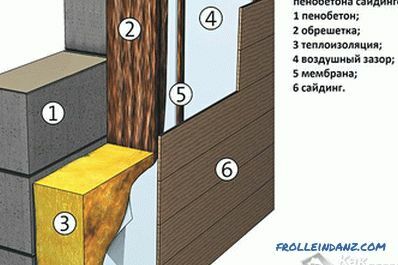 If you already have experience with this building material, then write comments at the end of this article. Your experience can help beginners.